Some of the deposits in Western Siberia are indeed close to exhaustion, but there are many large deposits with reserves of billions of barrels that have not been tapped. Russia’s economy is heavily dependent on the energy sector. Oil and gas alone are estimated to account for 16 percent of GDP, 52 percent of the federal government’s revenue, and 70 percent of the country’s exports. Russia’s future without oil is inconceivable, and would debilitate the country tremendously. Therefore, investments in the exploration of new oil reserves are imperative, but current Western sanctions are complicating this. The last of Russia's largest deposits on dry land - Erginskoye in the Khanty-Mansi Autonomous District - will soon be auctioned off. Its known oil reserves total 64.98 million tons, and potential reserves are estimated to be over 307 million tons. The starting price for the deposit is seven billion rubles ($123 million), and the winner will be announced on June 7. Among the many contenders for the deposit are Rosneft, Gazpromneft, Independent Oil and Gas Company, Surgutneftegaz and NOVATEK. One of the main conditions for the auction winner is the obligation to process all the deposit's oil in Russian refineries. 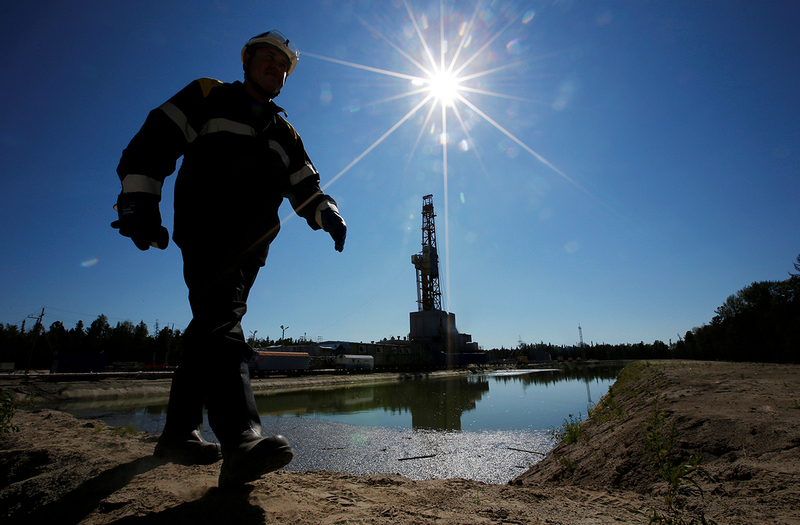 Erginskoye is the last major oil deposit on dry land that Russia has in its known reserves. What will happen next? The head of Sberbank, German Gref, recently said that Russia's supplies of the "black gold" would last up to 2028-2032, that is, only another 10-20 years. Experts and oil producers, however, do not agree. In March, Russian Energy Minister Alexander Novak said that Russia's explored oil and gas reserves will last for more than 50 years, with production costs at only 10-15 dollars per barrel. Additionally, there is huge potential for hydrocarbons locked deep within the Arctic shelf. "I’m amazed at these 'horror stories,' that oil in Russia will soon end and that 'everything is lost,'" said Sergei Donskoi, Minister of Natural Resources and Ecology, in an interview with the TASS news agency. "In reality, our explored traditional hydrocarbon reserves will last for at least 30 years, and this is if we don't invest in geological exploration and new technologies. But of course we’re investing all the time, which is why in 30 years there’ll be enough for another 30 years." Some of the deposits in Western Siberia are indeed close to exhaustion, but there are many large deposits with reserves of billions of barrels that have not been tapped. For example, those in the Western Siberian basin shelf are estimated at 3.6 billion barrels, and those in the Barents Sea shelf are estimated at 7.4 billion barrels. The challenge with those areas, however, is that it’s necessary to build infrastructure basically from scratch, said Roman Tkachuk of Alpari. Also, oil producers would have to attract long-term financing, something that is not desirable at the current low oil prices. Furthermore, foreign partners would have to participate in order to guarantee markets. "The most important thing about the shale revolution that took place in the U.S. is that it demonstrated the power of untraditional oil. This is a new type of oil that helped create new reserves. It not only concerns shale oil but also oil production from bitumen and so on," said Simonov. The cost of producing untraditional oil will be higher and it still has to be explored. "It’s one thing when you have more expensive oil, but it’s another thing when you have no oil at all. Japan, for example, doesn't have any oil, but we do. America has shale oil, Canada has bitumen oil, Russia has Bazhen and shelf," said Simonov. As long as Brent costs below 60-70 dollars per barrel, Russian companies will continue squeezing the `black gold’ out of deposits in Western Siberia and Khanty-Mansi, drilling new wells. The period of low oil prices, however, will not be forever, and to extract oil from the Earth prices don’t need to be 100 dollars per barrel. "Most of the projects in Eastern Siberia and the shelf become profitable when oil prices are between 60 and 80 dollars per barrel, but to develop the Arctic shelf it’s also necessary to attract modern technology from Western countries," said Tkachuk. "That’s why the future of oil development may also depend on the issue of lifting sanctions."